A HUMAN PERSPECTIVE Elephants in Europe? In 218 B.C., Hannibal, a general from Carthage in North Africa, attacked the Roman Empire, which was at war with Carthage. He moved 38 war elephants and an estimated 60,000 troops across the Mediterranean Sea to Spain. To reach Italy, his armies had to cross the Pyrenees Mountains, the Rhone River, and the Alps. Hannibal used rafts to float the elephants across the Rhone. In the Alps, steep paths and slick ice caused men and animals to fall to their deaths. Despite this, Hannibal arrived in Italy with 26,000 men and a few elephants, and he defeated Rome in many battles. His crossing of the Alps was a triumph over geographic barriers. On a map you will see that Europe is a large peninsula stretching to the west of Asia. Europe itself has many smaller peninsulas, so it is sometimes called a “peninsula of peninsulas.” Because of these peninsulas, most locations in Europe are no more than 300 miles from an ocean or sea. As you can imagine, the European way of life involves using these bodies of water for both business and pleasure. In northern Europe is the Scandinavian Peninsula. Occupied by the nations of Norway and Sweden, it is bounded by the Norwegian Sea, the North Sea, and the Baltic Sea. More than almost any other place in Europe, this peninsula shows the results of the movement of glaciers during the Ice Age. The glaciers scoured away the rich topsoil and left only thin, rocky soil that is hard to farm. In Norway, glaciers also carved out fjords (fyawrdz), which are steep U-shaped valleys that connect to the sea and that filled with seawater after the glaciers melted. Fjords provide excellent harbors for fishing boats. The fjords are often separated by narrow peninsulas. The Jutland Peninsula is directly across the North Sea from Scandinavia. Jutland forms the largest part of Denmark and a small part of Germany. This peninsula is an extension of a broad plain that reaches across northern Europe. Its gently rolling hills and swampy low-lying areas are very different from the rocky land of the Scandinavian Peninsula. The Iberian Peninsula is home to Spain and Portugal. The Pyrenees Mountains block off this peninsula from the rest of Europe. The Italian Peninsula is home to Italy. It is shaped like a boot, extends into the Mediterranean Sea, and has 4,700 miles of coastline. The Balkan Peninsula is bordered by the Adriatic, Mediterranean, and Aegean Seas. It is mountainous, so transportation is difficult. The mountains and uplands of Europe may be viewed as walls because they separate groups of people. They make it difficult for people, goods, and ideas to move easily from one place to another. These landforms also affect climate. For example, the chilly north winds rarely blow over the Alps into Italy, which has a mild climate as a result. The most famous mountain chain in Europe is the Alps. On a map you can see that the Alps arc across France, Italy, Germany, Switzerland, Austria, and the northern Balkan Peninsula. They cut Italy off from the rest of Europe. Similarly, the Pyrenees restrict movement from France to Spain and Portugal. Both ranges provide opportunities for skiing, hiking, and other outdoor activities. Running like a spine down Italy, the Apennine Mountains divide the Italian Peninsula between east and west. The Balkan Mountains block off the Balkan Peninsula from the rest of Europe. Historically, they also have isolated the peninsula’s various ethnic groups from each other. Mountains and uplands differ from each other in their elevation. Uplands are hills or very low mountains that may also contain mesas and high plateaus. Some uplands of Europe are eroded remains of ancient mountain ranges. Examples of uplands include the Kjølen Mountains of Scandinavia, the Scottish highlands, the low mountain areas of Brittany in France, and the central plateau of Spain called the Meseta. Other uplands border mountainous areas, such as the Central Uplands of Germany, which are at the base of the Alps. About one-sixth of French lands are located in the uplands called the Massif Central. Traversing Europe is a network of rivers that bring people and goods together. These rivers are used to transport goods between coastal harbors and the inland region, aiding economic growth. Historically, the rivers also have aided the movement of ideas. Two major castle-lined rivers—the Danube and the Rhine—have served as watery highways for centuries. The Rhine flows 820 miles from the interior of Europe north to the North Sea. The Danube cuts through the heart of Europe from west to east. Touching 9 countries over its 1,771-mile length, the Danube River links Europeans to the Black Sea. 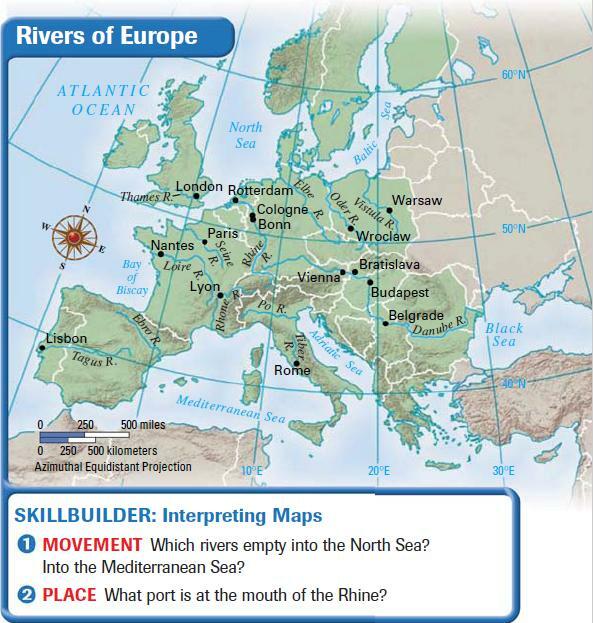 Many other European rivers flow from the interior to the sea and are large enough for ships to traverse. Through history, these rivers helped connect Europeans to the rest of the world, encouraging both trade and travel. Europeans have explored and migrated to many other world regions. One of the most fertile agricultural regions of the world is the Northern European Plain, stretching in a huge curve across parts of France, Belgium, the Netherlands, Denmark, Germany, and Poland. Relatively flat, this plain is very desirable agricultural land that has produced vast quantities of food over the centuries. However, the plain’s flatness has also allowed armies and groups of invaders to use it as an open route into Europe. Smaller fertile plains used for farming also exist in Sweden, Hungary, and Lombardy in northern Italy. Europe has abundant supplies of two natural resources—coal and iron ore—needed for an industrialized economy. The map above shows a band of coal deposits stretching from the United Kingdom across to Belgium and the Netherlands and from there to France, Germany, and Poland. Near many of these coal deposits are iron ore deposits. Having both of these resources makes it possible to produce steel. The Ruhr Valley in Germany, the Alsace-Lorraine region of France, and parts of the United Kingdom are heavily industrialized because these minerals are found there and good transportation exists. But as a result, these regions have suffered from industrial pollution. Oil and natural gas were found beneath the North Sea floor in 1959. Energy companies began to tap gas fields between the United Kingdom and the Netherlands. In 1971, new technologies made it possible to construct offshore oil rigs in the North Sea despite its deep, stormy waters. Norway, the Netherlands, the United Kingdom, and Denmark now pump oil from rigs as far as 400 miles out in the ocean. The North Sea oil fields are major sources of petroleum for the world. About 33 percent of Europe’s land is suitable for agriculture. The world average is 11 percent, so Europe is especially well off. The land produces a variety of crops: grains, grapes, olives, and even cork. Timber is cut from vast forests on the Scandinavian Peninsula and in the Alps. As is true of every region, the resources available in Europe help shape the lives of its people. Resources directly affect the foods people eat, the jobs they hold, the houses in which they live, and even their culture. For example, traditional European folk tales often take place in deep, dark forests that were a major part of the European landscape centuries ago. The distribution of resources also creates regional differences within Europe. For instance, because Ireland lacks energy sources, the Irish cut peat from large beds and burn it as fuel. Peat is partially decayed plant matter found in bogs. 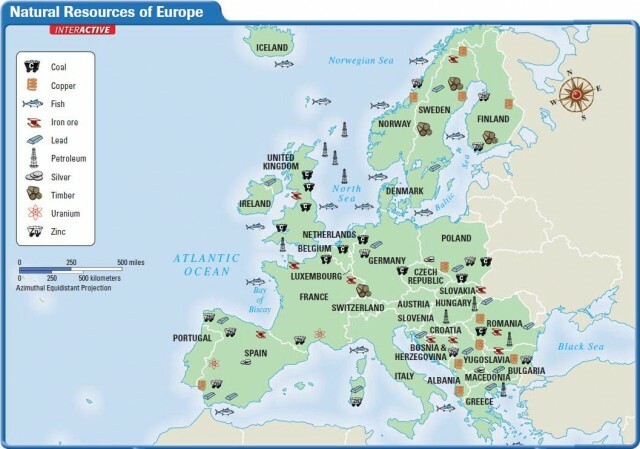 In contrast, coal is plentiful in other parts of Europe and has been mined for centuries. For example, generations of Polish miners have worked the mines that modern-day Poles work. Just as landforms and resources influence the lives of people, so does climate. 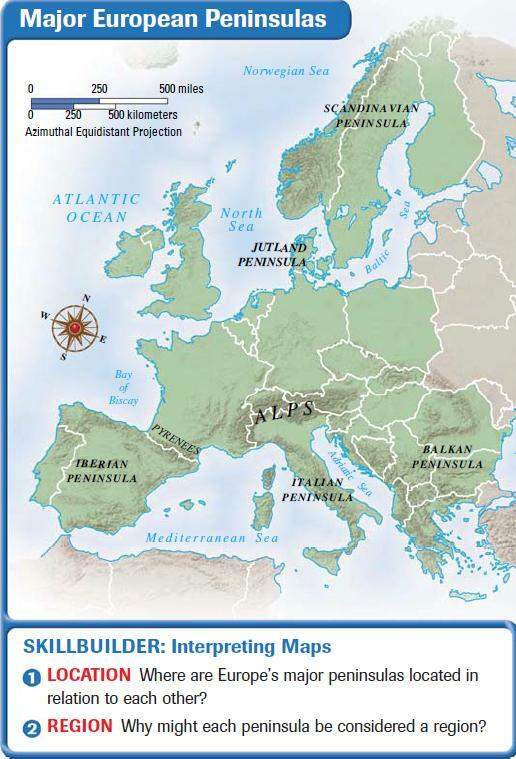 In Section 2, you will learn that the climates of Europe are mild near the Atlantic Ocean and grow harsher inland. You will also learn about the climates of the Mediterranean and the Arctic regions.